Every week it seems there’s a new way for Artificial Intelligence (AI) technology to make our day-to-day lives easier, and this week is no different. Millions of American consumers use Amazon Alexa every day, and soon, they will be able to search for local business information with a simple voice query. 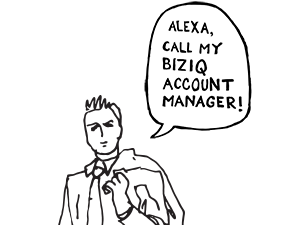 BizIQ is excited to announce that every one of our local SEO clients will be part of an exclusive group of businesses who will be among the first to have their information synced with Amazon Alexa! This service will be included completely free of charge to all current and future BizIQ customers wth an active local SEO subscription. BizIQ has long been committed to giving small businesses a competitive edge in a digital world. This past year, we began including SSL encryption and a cutting edge global content delivery network (CDN) on all of our local SEO subscriptions as part of our SecureIQ update. Prior to that, we began offering updated spam protection for all of customers, again, completely free of charge. This exciting new opportunity is just one more way of fulfilling our mission of bringing big business solutions to our small business partners. Are you a BizIQ customer with questions about this update to your service? Just reach out to your Account Manager. As always, we’re here to help. If you’re interested in joining the nearly 20,000 small businesses who trust BizIQ with their online marketing efforts, request a free website audit and we’ll show you in 10 minutes or less how you can get more from your marketing for less.